Fragments. Sneaky little things. Writing land mines. Bad for flow. Worse for clarity. Popping up everywhere. A run-on’s nemesis. Nope. Gotta go. Huh. It seems I’m talking about sentence fragments and how they’re bad. But something doesn’t seem right. The words above are confusing. And that’s because they only make up fragments, so our brains notice that something’s off. The words and concepts are there, but they’re not lining up quite right or flowing smoothly. In short: fragments are bad. A sentence is a complete thought, almost always with a subject and a verb. At its most basic, a sentence has a thing doing something or having something done to it. In a fragment, at least one of these elements is missing, and so the fragment can’t stand on its own as a complete thought. A fragment is a chunk of thought, an orphan that can’t make it on its own. Why Shouldn’t We Use Fragments? Because they can’t stand on their own. No, wait. That was a fragment. Take a closer look: that “sentence” is really a dependent clause; it relies on the question asked just before it to make sense. If you read that fragment, “Because they can’t stand on their own,” without context, you wouldn’t know what it meant. Was I talking about puppies who can’t stand without help? Maybe. Fragments should be avoided because they depend on the sentences around them to make sense. All sentences should make sense on their own and should make even more sense when read in context with the sentences before and after that. Only then do you have clarity. We use a lot of fragments in our everyday speech because humans are naturally lazy and speech occurs in context. As a result, we’ve gotten used to hearing fragments during conversations and may think it’s OK to use them in our writing. But fragments are never acceptable in formal writing; if you’re writing a school paper, a cover letter, a business document, or the like, avoid fragments. However, there are a few cases where fragments may be acceptable. You’ll love your new haircut or your money back. Guaranteed! What is guaranteed there? We assume that it’s either you’ll love your haircut or that you’ll get your money back, but it’s not clear. That’s also how sentence fragments can trick you (the opposite of being clear). As you can see, fragments may be catchy and casual, but they’re not straightforward. “I’ve searched everywhere,” she said. If you …read that last bit on its own, you wouldn’t know what is going on. But our searching heroine isn’t expressing herself in full sentences. She’s sighing out her problems in fragments. Fragments can make your dialogue sound more realistic and be more engaging. Just be sure to use them judiciously; an entire passage made of fragments would be incredibly difficult to read because it would be choppy and provide little guidance to the reader about what is going on. How Do I Avoid Fragments? Does it make sense standing all alone? If you can answer yes to all three, congratulations, it’s a sentence! If the answer to one or more is no, you have some work to do to fix your fragment. If it’s missing a verb (that is, your action word), that’s relatively easy to fix: add the necessary verb. If it’s missing a subject (that is, the thing doing the action or having the action done to it), you should add that. Fixing fragments that are dependent clauses is a little harder, but there’s a good trick you can use. 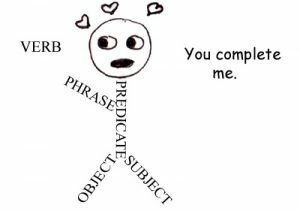 Many dependent clause fragments can be spotted because they start with a preposition or a conjunction: after, although, and, because, before, but, if, or, then, though, unless, until, when, where, who, which, that, and so on. Take a look at the sentence before the fragment you’ve identified. Do you have to join them to have the words make sense? Jake grit his teeth and prepared to jump. Because he didn’t have much choice, given the rabid weasels behind him. Other ways fragments sneak in are with lists and long descriptions. Fragments can be as lengthy as any complete sentence. It’s not the number of words. It’s being a complete thought. The best way to avoid fragments in your writing is to look for them actively in your writing, and you can practice by mentally fixing them elsewhere. Take a look at the advertising you see every day and see how many fragments you can spot, then try fixing them in your head so that they’re full sentences and complete thoughts. Good luck! It’s a tough task, but you can do it.